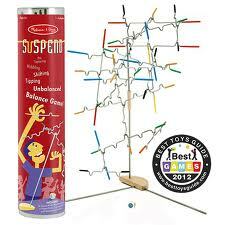 One of the hottest toys this year is Suspend from Melissa and Doug. Everyone at Learning Express is raving about it and with good reason! Suspend is a balancing game that is easy to learn and impossible to put down. The pieces hang from a tabletop centerpiece, but watch out! Every rod you place will shift the game! It’s sure to be a family favorite for years to come. Plays with 1-4 people ages 8+. Encourages planning skills and hand-eye coordination. 24 weighted pieces and color coded dice included.